In late November 2017, Evan Matthews, a PhD research student based in the Department of Nursing and Health Care, Waterford Institute of Technology travelled to Sydney following an offer to join a team of leading researchers in the School of Psychiatry, University of New South Wales (UNSW). Evan’s research area of interest is physical activity for people with mental illness. 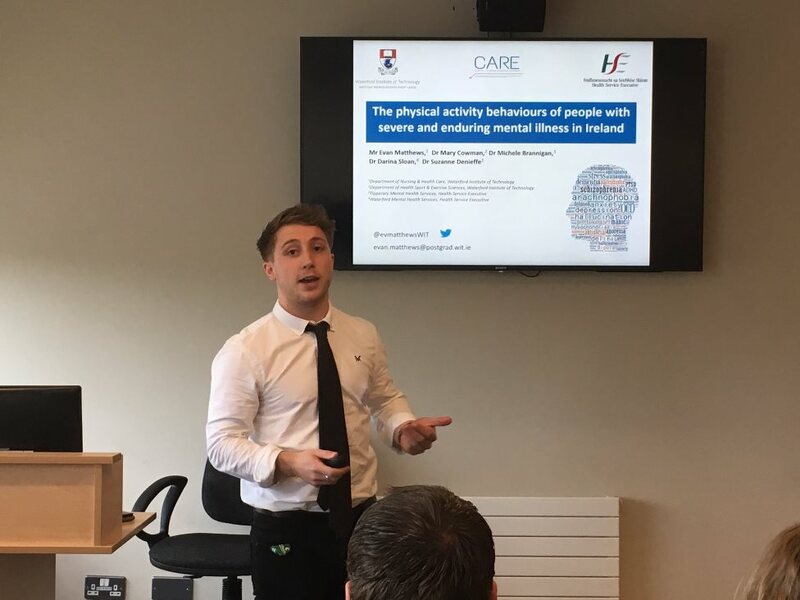 During the first phase of his PhD, he has been investigating the influencing factors on physical activity for people with diagnosed mental illness in Ireland. Sydney has always been an eminent example for public health in terms of general physical activity promotion, but more recently, it has become home to a pioneering clinical research team headed up by Research Unit Lead and Clinical Neuro-Scientist, A/Prof Phil Ward and Clinical Lead, Dr Jackie Curtis that are based in The South Eastern Sydney Local Health District, Bondi Community Health Centre and the School of Psychiatry, UNSW. The UNSW/Bondi team have pioneered a comprehensive programme to address the deficiencies in physical health that mental health patients experience during care; essentially reversing negative assumptions about the life course of people with mental illness that were once thought to be an unavoidable consequence of their diagnosis. Named ‘Keeping the Body in Mind (KBIM)’, this pioneering initiative is supported by a team of specialists including exercise physiologists with expertise in mental health, in addition to dieticians and a clinical nurse specialist with particular expertise in treating metabolic disorders. Findings from research conducted by KBIM have already demonstrated that weight gain as a conseqeunce of taking new anti-psychotic medication is avoidable; something which was previously considered to be an unfavourable side-effect of treatment. Additionally, other mental health populations have shown better mental health outcomes from engaging in wider lifestyle interventions like KBIM. Evan’s PhD research, supervised by Dr Suzanne Denieffe (Department of Nursing and Health Care, WIT) and Dr Mary Cowman (Department of Sport and Exercise Science, WIT), ultimately seeks to promote fundamental change to the way mental health services in Ireland deliver physical activity interventions. Consequently, the experience Evan has gained from spending time with the various research and clinical teams in Sydney and the opportunity to observe how the mental health services in New South Wales address the physical health crisis among people with mental illness is making a valuable contribution to his work going forward. During his time in Australia Evan participated in some significant research events. Some of his PhD research was presented at the annual Society for Mental Health Researchers Conference in the Australian capital Canberra. Furthermore, the on-going research of the WIT team was received with great interest and has since been discussed at a clinical practice level in the Black Dog Institute which is a translational research unit for mood disorders based in Sydney. The pinnacle of the trip was however the SIMPAQ international collaborators meeting. The SIMPAQ physical activity measurement tool was developed in 2014 by the UNSW School of Psychiatry team led by Dr Simon Rosenbaum and A/Prof Phil Ward. In the intervening time, a multi-site validation study with over 1000 data points, using objective measures of physical activity with people with diagnosed mental illnesses has been ongoing across the developed and developing world. Being the Irish site investigator, Evan was invited to speak at the meeting to discuss the impact that SIMPAQ has had in the Irish mental health care context. The meeting proved to be a resounding success in terms of mapping the success of SIMPAQ to date. With input at the meeting from renowned experts in the field such as Dr Felipe Schuch (Universidade Federal do Rio Grande do Sul, Porto Alegre), Dr Brendon Stubbs (Kings College London) and Prof Adrian Bauman (University of Sydney), plans have been put in place to take the SIMPAQ further on its path to being a part of routine monitoring in mental health care and, most importantly, to shine more light on the importance of physical activity in mental health care. With the validation study for SIMPAQ still being written up, those that are interested in finding out more information can visit www.SIMPAQ.org.